You'll be £4.99 closer to your next £10.00 credit when you purchase Murder and Mayhem in Sheffield. What's this? Sheffield born actor and author Geoffrey Howse delves into his files covering over 200 years of Sheffield's criminality. 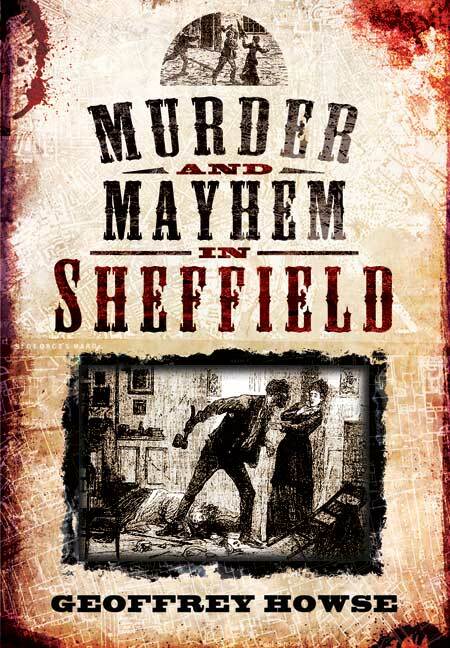 In Murder & Mayhem in Sheffield he takes a look at some of the events that took place during a period of enormous growth within Sheffield; including a failed plot to murder some of Sheffield's officials, take control of the Town Hall and set fire to the homes of prominent citizens; the series of incidents known as the Sheffield Outrages are also mentioned, as are the notorious Sheffield Gang Wars of the 1920's. Murders from the eighteenth century through to 1947 are covered, including he fascinating case of one of Britain's most notorious murderers, Charlie Peace. The gruesome Shelf Street Hatchet Murder of 1881, is also included as are the Woodhouse Murder of 1893 and the Chinese Laundry Murder of 1922. Two Sheffield murderers who bore the same name, William Smedley, and who were both hanged for their crimes, committed murder in 1875 and 1947 respectively, are also featured. Although not for the feint-hearted, this book is sure to capture the curiosity of all individuals with an interest in the social and criminal history of Sheffield. By delving into his extensive research, covering over 200 years of Sheffield's criminality, Geoffrey Howse gives readers an insight into some of the acts of violence and dreadful murders that have been committed in the city from the 18th century to the middle of the 20th century. A good mix of short reports on some little known murders in the Sheffield area and some with greater detail. most of the longer ones I knew about but there were details I was not aware of. There were also cases I have never heard about and I know many Yorkshire cases. I enjoyed the book, it was entertaining and informative and to his usual standard. I can recommend this book.